Create colorful towers that lean, sway and bend, or carefully align to make one that is perfectly straight. These clever blocks are fun for any age, but ideal for the little hands on kids as young as 6 months old. Each one has added texture to promote touching and provide tactile stimulation, and the wavy edges make them easy to hold on to. Young children don't always have a strong grip, so the little finger indents will help them control the pieces, and stack without the tower toppling. 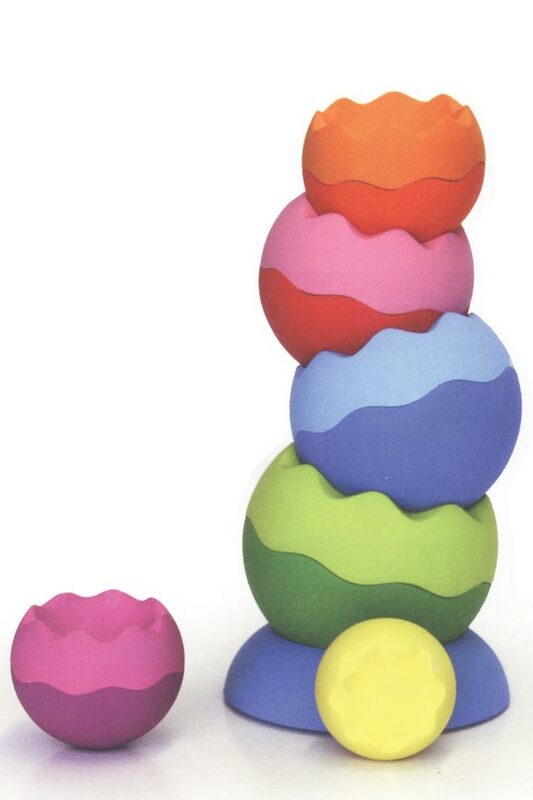 Because each sphere has a different weight, Tobbles Neo will allow children to balance easily as they construct a multitude of towering possibilities. The pieces can stack and nest in many different ways, and thanks to the unique weights and sizes, the resulting designs will bend and spin without falling over. The outer texture and edge detailing help to facilitate building, so when compared to other sets, this one is far easier and less frustrating to play with. Don't get them traditional blocks that only slip and slide. These ones are better because they are so simple for any child to use, and they also offer greater construction versatility. Due to the overwhelming appeal of the Original Tobbles, this version was created in order to be an option geared toward younger children. Although this version is easier for small hands to build with, it is still fun enough to entertain adults, and the optional challenges can engage kids all the way into their teens. It can be used very simply, or you can push the boundaries to see what is possible. This is why toddlers will love it upon first touch, and it will remain a constant fixture in the toy box for many years to come. The high quality construction and materials used will ensure that it lasts as long they desire to use it, and it is possible for several children to share it through the years without the pieces showing wear, or getting broken. Tobbles Neo will introduce kids to physics and spacial reasoning without them even realizing it, and because of the unique way in which you build with this set, children will also develop problem solving skills too. Little ones will pick up, touch, roll and explore the differing pieces as they begin to stack and construct small towers. As kids get older, they will use all of the pieces to make taller towers, that bend and twirl in space, and almost seem to defy gravity as they lean without falling over. Little hands can't resist these blocks. They are shaped like spheres but one side is indented to become concave. This concave side has wavy, grippable edges, and the entire block is textured. Children can use them upside down or right side up, and they are able to nest or stack depending upon orientation. On a flat surface, individual pieces rock back and forth or roll making it just as fun to knock them over as it is to stack them up. 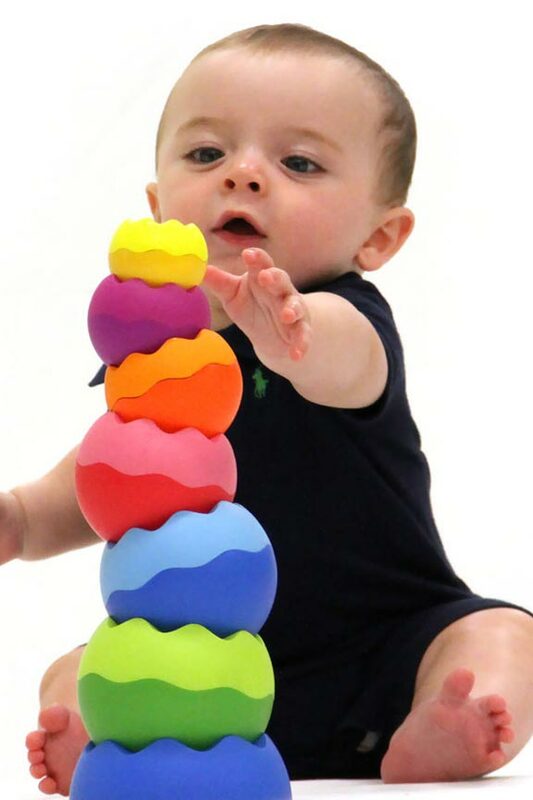 Every baby needs at least one stacking toy, and this one is ideal for almost any age or skill level. Kids can play with each piece individually, or use them together to build tall structures that can be manipulated where they stand, or toppled just for fun. By varying weight and size, while adding texture and ridges, these pieces will stack easily, and even towers that look like they are falling will remain balanced to build confidence and increase possibilities. This set includes six attractive stacking blocks and one vibrant base to build on. The colors will draw children in, the weight and texture will increase interest, and the endless design possibilities will prevent them from putting it down. Don't settle for run of the mill stacking toys, or ordinary building blocks. Tobbles Neo offers innovative design, and guaranteed fun. Teach your children valuable skills like sensory awareness and spacial relationships as they laugh and learn by building with this toy. Order Yours Today! Uses Stack, nest, spin, roll, toss and more. A versatile stacking toy suitable for the youngest of children. # Pieces 7 Total. 6 "blocks" in varying sizes, and 1 base. Textured Yes - Added texture encourages more touching and playing. Weighted Yes - Each sphere has it's own unique weight. 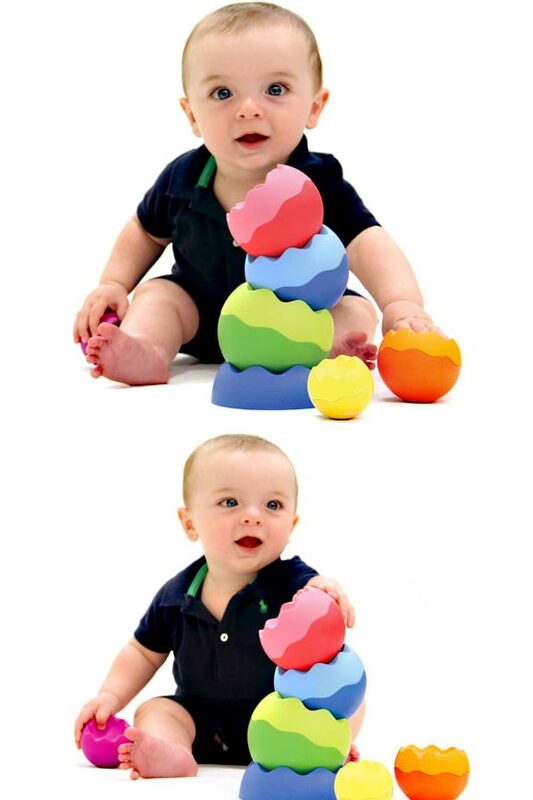 Tobbles Neo - A fun stacking set for children as young as 6 months old. Teach colors, hand-eye coordination, construction skills, patience and much more as your child stacks, spins, balances and more. Clever shapes, vibrant colors, and differing weights makes for endless enjoyment, and offers tons of replay value. Order Yours Today! My wife and I bought these for our 9 month old Granddaughter. She absolutely loves them! It's so fun to sit and watch her knock the tower down and then wait for a rebuild. She also finds them as a "handy" teething soother. Very well made and extremely fast delivery. Thank you!! Is there BPA in this product? No. There is not. They are completely safety tested and free of BPA. Perfectly fine for teething toddlers, and curious babies.